The line for lunch on a Saturday at Lee’s. 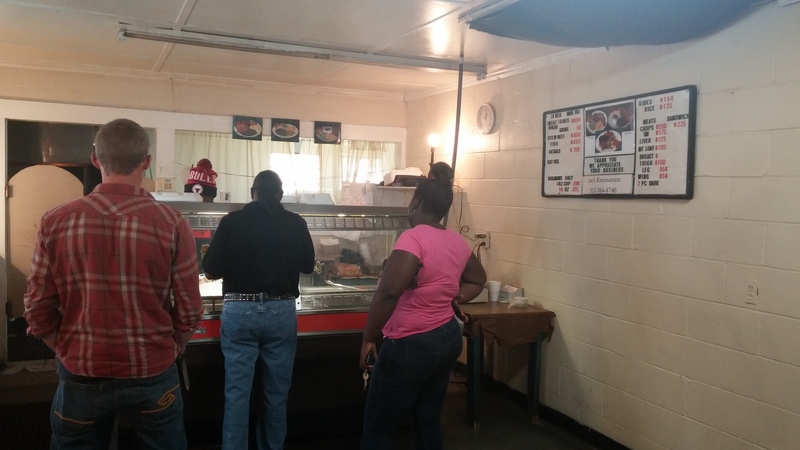 When you walk into Lee’s, you pass through the dining room to get to the buffet line. There, you wait your turn to place an order. There is no hostess stand or lobby area, but the employees greet you with kindhearted sincerity and genuine Southern hospitality. If you choose to dine in, you simply take your plate and find a seat. The dining room at Lee’s. Blue and white checkered flooring and an eclectic mix of tables and chairs make up the open dining room. Ceiling fans, a mix of silk and live plants and a quaint fire-place add character to the atmosphere. 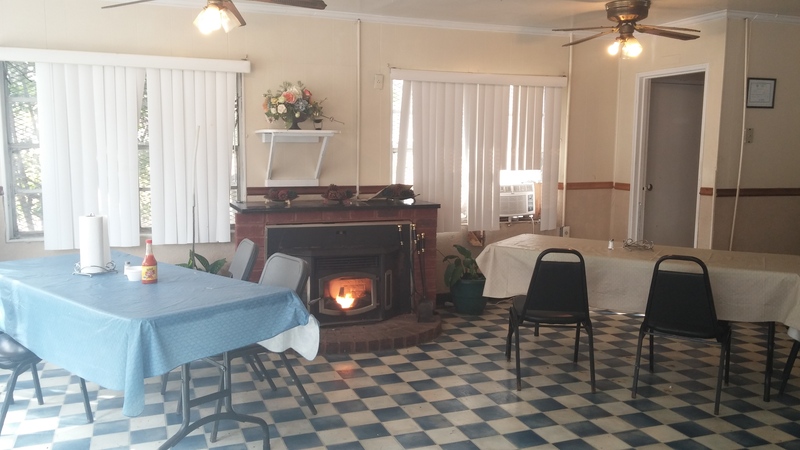 The chairs may have a few rips in their cushions and the tablecloths may not match, but what the restaurant lacks in decor, they more than suffice for in flavor of food. Hot sauce, pepper sauce and mustard condiments sit on each table, along with a handy roll of paper towels. Fried fish, fried chicken, meat loaf and liver are a few of the meat choices. Diners may select their choice of a meat and three or a vegetable plate. Green beans, mashed potatoes, macaroni and cheese and corn on the cob are just a few of the side options featured on the buffet. The buffet includes a wide variety of mouth-watering dishes, timeless food that to those of us blessed enough to be from the South, tastes like home. The sheer smell takes me back to my grandmother’s kitchen and transports me to Dinner on the Grounds during Homecoming at my Baptist church. 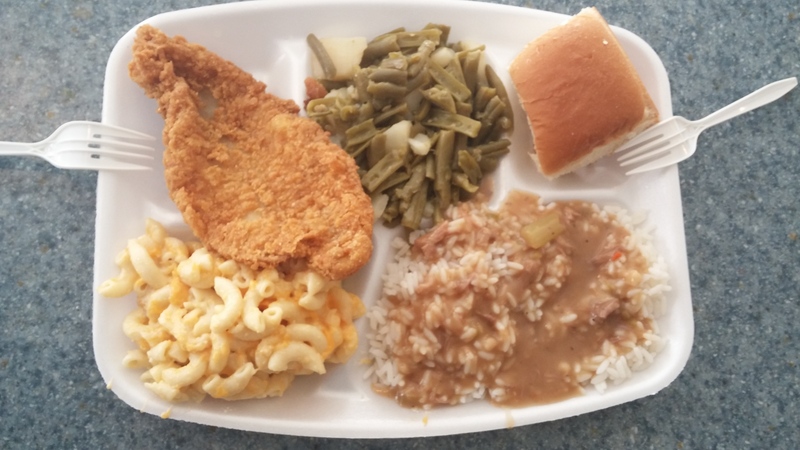 There are pork chops, liver, neck bones, fried fish, stew beef, meat loaf, macaroni & cheese, rice and gravy, green beans with potatoes and ham-hock, mashed potatoes, corn on the cob and fried okra. Dinner is served with your choice of roll or corn bread, sweet tea or lemonade. Here you won’t find a soft drink machine or even a vegan or vegetarian-friendly menu offering tofu and gluten-free options. What you see is what you get, and what you get is pure, Southern gold. Home cooking at Lee’s Restaurant in Statesboro, Georgia. My meat and three with a dinner roll and sweet tea hit the spot. This is the kind of meal that is indigenous to a place, the kind you long for when traveling outside the boundaries of Dixie. It is a delicacy–a plate most Northerners envy and can only aspire to duplicate. It is a flavor and taste many cooks never quite master, one that requires no culinary education, but yet a deep-rooted connection to the foodways of a land. This is a meal that should never be taken for granted. The price for this plate was $6.92 including the tea. Priceless. 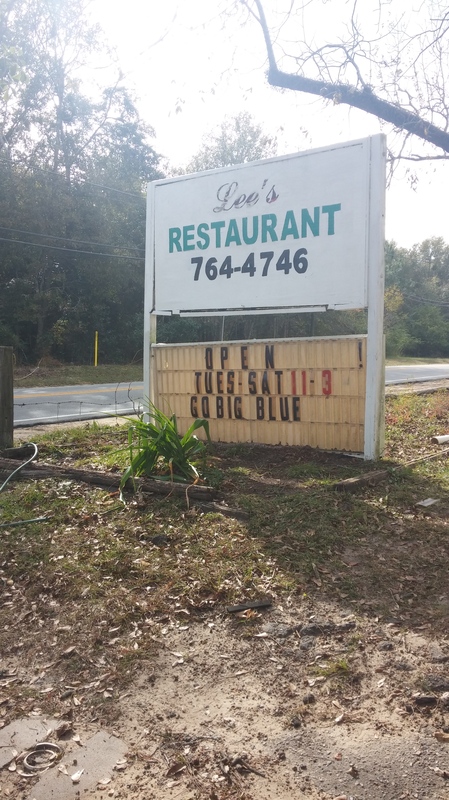 Lee’s Restaurant is open for lunch Tuesday – Saturday from 11 a.m. to 3 p.m. I sure love the “Go Big Blue” shout out on their outdoor sign. Any business who supports my Georgia Southern Eagles and serves up fine food such as this, is a place I’ll return to again and again. 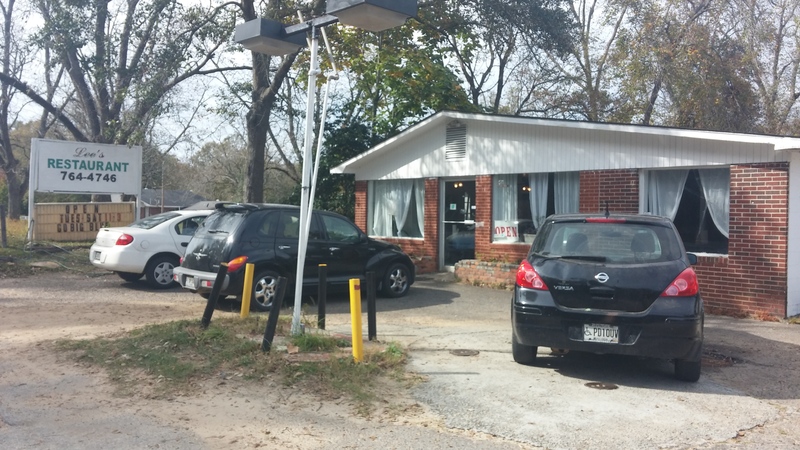 With Google reviews like “Best southern cooking around!” and “Don’t let the decor fool you,” take a little detour and see for yourself. Lee’s Restaurant is Some Kinda Good! Thanks for stopping by! If you like this post, you may also be interested to read about a few of the other local restaurants and bakeries I’ve reviewed. As the Statesboro Herald food columnist and a Georgia Southern University alumna, the ‘Boro is a second home to me. Be sure to like Some Kinda Good on Facebook, or follow me on Twitter and Instagram, to keep up with all my latest, local food discoveries.